Vamous Young People's Theatre group us led by Kathryn Green. The group meet weekly in term time where members, aged 9 to 14 years, learn about teamwork, focus, commitment, humour, and being reliable. They learn acting skills like developing character, physicality, being open, devising stories, and (best of all) the skills of using full mask. Members of VYPT get the chance to work with Vamos’s professional production team and create a performance at the end of every term. Vamos Young People’s Theatre are recruiting! Thanks to the generous support of the Bransford Trust, Vamos Theatre is now recruiting members for its Young People’s Theatre group for 9-14 year olds. 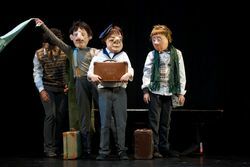 The weekly sessions, held at Worcester Arts Workshop, introduce young people to the basics of mask theatre, and provide a solid and creative platform for other theatre and physical theatre skills. Young people will get the chance to work with Vamos’s professional production team and work towards a performance at the end of term, last year performing as part of a consortium of youth theatres in the Physical Fellowship at The Belgrade Theatre in Coventry. Children from several Worcester primary and secondary schools are already signed up, including Bishop Perowne, Christopher Whitehead, Pitmaston, Stanley Road and St Georges. Sessions, start on September 28th, and will be held weekly on Wednesdays between 5:30 and 6:45pm until December 14th. The first trial session is offered free of charge, after that the cost is £50 per term, and members can take advantage of a monthly payment system to assist with costs. If you or your child would be interested in joining the group, please contact the Vamos office on 01905 312921.